When I was a kid, summer was the best time of the year. The minute the last school bell rang we joyfully headed out the door into three months of freedom. Our days were filled with sleeping in as long as we wanted and then playing hard all day long until we fell into our beds content, but thoroughly exhausted. Since we’ve started a family of our own, summer has become the perfect time for the “family vacation”. It generally consists of Shaun coming up with some hair-brained idea….like traveling Route 66 and taking a couple of months to talk me into it. Of course it always ends up becoming a wonderful memory. That still doesn’t stop me from dragging my feet the next summer though. Although spring has barely arrived, this summer is already filling up. There are so many things we want to do that we can barely cram them all in. First off, KT received this letter in the mail. Speaking of driving, KT is also ready to take driver’s ed. I’m not entirely sure the poor innocent drivers in are area are ready for that, but she’s old enough and that’s what they go by. My dad has come up with this brilliant plan to take the girls traveling across the upper states in the RV. Mimi is all for it. KT is not so sure when she will be able to fit it in. I personally have doubts as to whether or not my father is still up to the trials and tribulations of a headstrong teenage girl. But it’s really starting to sink in that my babies only have a few more summers of being kids. I fully intend to let them make the most of these short month of freedom. Whatever they end up doing with their summer, I want them to realize how important is to sleep in, play hard and fall asleep exhausted…. This entry was posted in Adventures, KT, Mimi, Traditions. Bookmark the permalink. Congrats to KT! I hope this leads her on a path to a career. What a great opportunity to try it on for size. I remember summers just like yours; they were grand! Congrats to KT! That is soo cool. And it’s great that she lives in an area that has those types of opportunities. And parents who encourage her to take advantage of those things. Summer vacation has some great memories. how fun for her! We always try to go to an Aquarium in a place we vacation …..the kids love it! Congrats to KT! That is a terrific opportunity and I am sure she’ll have fun. Ahh….the carefree summer. We didn’t have air conditioning in the house when I grew up, so my mom would let us reverse our days once it got too hot and humid to do anything during the day (which was pretty much the whole month of August, if not longer). It was so neat to sleep all day and get up around dinner time. I hate driving to Seattle, too. I’ve never driven to Seattle, but I’m pretty sure I hate it since I hate driving through mountains. I’m so pleased KT was chosen as a volunteer at the aquarium! That would have been my dream summer job!! Lucky lucky girl!! ah….sleep in , play hard, fall asleep exhausted…..that sounds so wonderful. What a wonderful attitude fo a mom. I hope that summer brings some hot , hazy, lazy days for all of us. 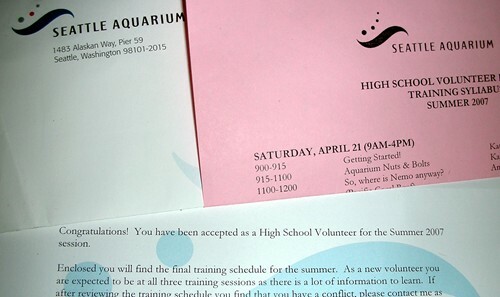 However, working as a volunteer at the Aquarium should be a fabulous experience. Still I hope there is plenty of time just to chill. woohoo, congrats to your baby girl!! what a wonderful girl you have. I wish you a warm beautiful summer and more to come. you’re a wonderful mother, too. Summertime, summertime…I can’t wait. Sounds like lots of memories are waiting to be made. You will be busy. Have you been to Lumberton in the summer? I was there twice and loved it.